Lamination of documents has become very popular lately. Not only large print shops can afford to purchase the special laminating. But in order to make the right choice of this device should focus on the technical details. All laminators can be divided into batch and roll. The latter are often used in print shops and copy centers. Well, batch is more suitable for small companies and home use. Batch laminators can also be classified on the device office and professional series. Usually they are used for laminating legal size documents. With regard to office laminators series, they have simple construction and are low cost. In such devices the heating element are usually special hot plates or shafts. Professional laminators have increased reliability and performance. They provide the highest quality lamination. The main disadvantage of batch laminators should be considered high cost of consumables. Roll laminators are good that allow you to process documents of any formats. With their help it is even possible to carry out foil stamping. But in contrast to the batch, not all of the roller devices allow unilateral and bilateral lamination. But roll laminators are low cost consumables and high productivity. They allow us to produce large production runs. Well, the disadvantages of such laminators include the complexity and duration of their service. One of the main criteria when choosing a laminator should be considered as the type of heating element. The device with hot plates capable of passing the film across a narrow slit. At the exit she prespectives rubber shafts. 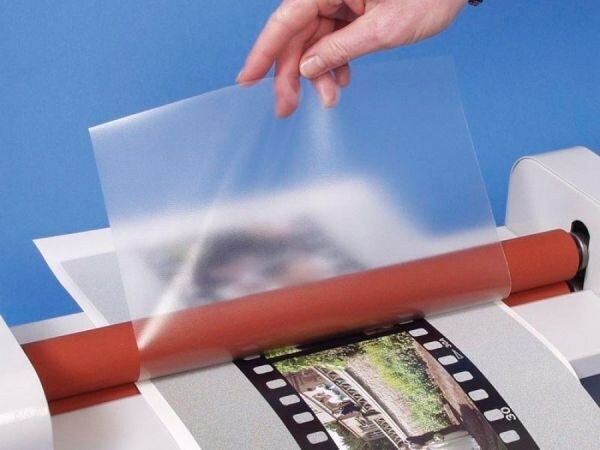 In such laminating film may be heated unevenly, and the result is very poor quality. But laminators with shaft heating suitable for processing all types of surfaces. Excellent lamination glossy surfaces in this case is guaranteed. In the course of any of the laminating machine, the document can be wound on the shaft. The result may be damaged not only the device itself, but also the original document. If you choose a laminator with a reverse function, this trouble is not exactly threatening. This feature is that with one click you can easily remove the blank back. If the lamination process is used film of different thickness, it is better to get a device with temperature-controlled rollers. As for each film type requires a specific temperature.